Life in the wild west can be dangerous but it certainly has its upsides. For instance, you really don't have to worry about traffic when you're heading out to the high plains to herd up those doggies. No, we don't mean puppies, we mean the buckaroo term for cows, if you're going to do that then you're going to need to learn the lingo. Oh, speaking of the plains, let's talk about that particular workplace. Lunch is beans and coffee while sitting on your "hoss" with a mountain view instead Ramen under fluorescent lights while your coworker tells you about what they watched on television this weekend. While we're sure that western life wasn't easy, a cowboy lifestyle seems pretty good to us right now! 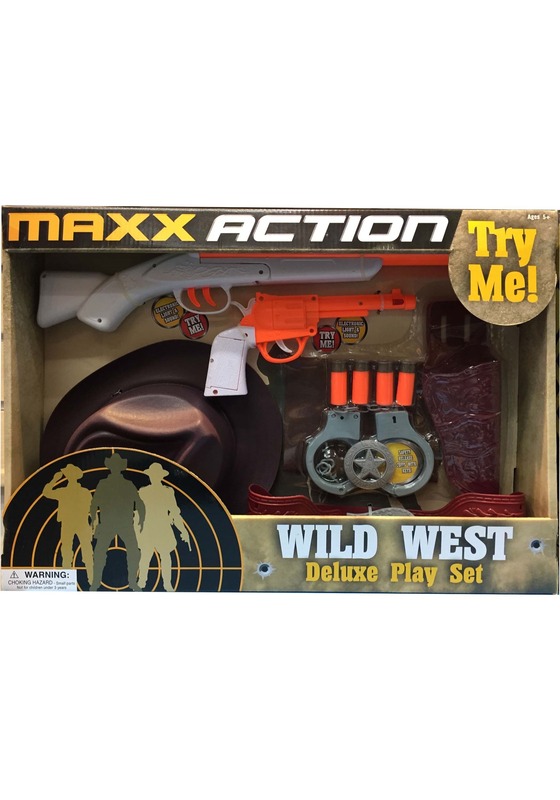 This ten piece set has everything a cowpoke in the Wild West needs. Your child will have the outfit essentials like a hat, vest, belt, and holster. Then there's the silver badge in a nice, hearty plastic, and plastic handcuffs. And let's not forget the guns, they call the west wild for a reason after all! The shotgun and revolver have bright toy barrels with four shotgun shells. 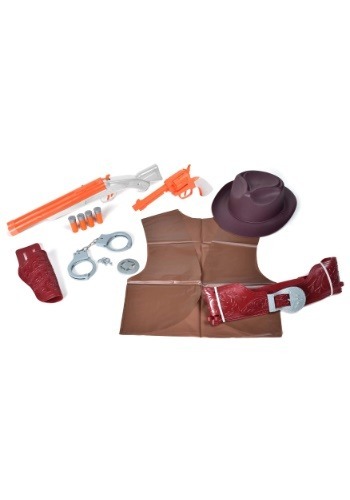 This kit has everything your child needs to let loose a happy, "Yee Haw"! Is your little one ready to jump up on that horse and head into the sunset? We're pretty excited for your kiddo's new career. And while we're not sure how intense the job market is for cowpoke these days but playing the harmonica under a starry sky next to a campfire sure sounds good right now!